As I predicted, it was two out of three. There was no Sky coverage in Inchnadamph. Still, Forest secured a 2-2 draw away to Bolton which continues a good start to the season. Judged by its name, Cape Wrath sounds forbidding, a place where one dares to go rather than chooses to go. Actually it was named by Norse sailors and means ‘turning point’. When you get there you can see why. The most north westerly point in the UK mainland is very sharply defined and you can actually see the turn from the Atlantic Ocean in towards the Pentland Firth. Professor Judith Jesch, a Viking expert in our School of English, recently wrote a paper entitled ‘The Threatening Wave : Mapping North British Waters in Old Norse Poetry’. It refers extensively to the work of Grimr Hjaltason, mostly recounting journeys with towering seas in which Cape Wrath features. When we arrived, there were no threatening waves, no towering seas. The ocean was placid and the peninsula bathed in sunshine. 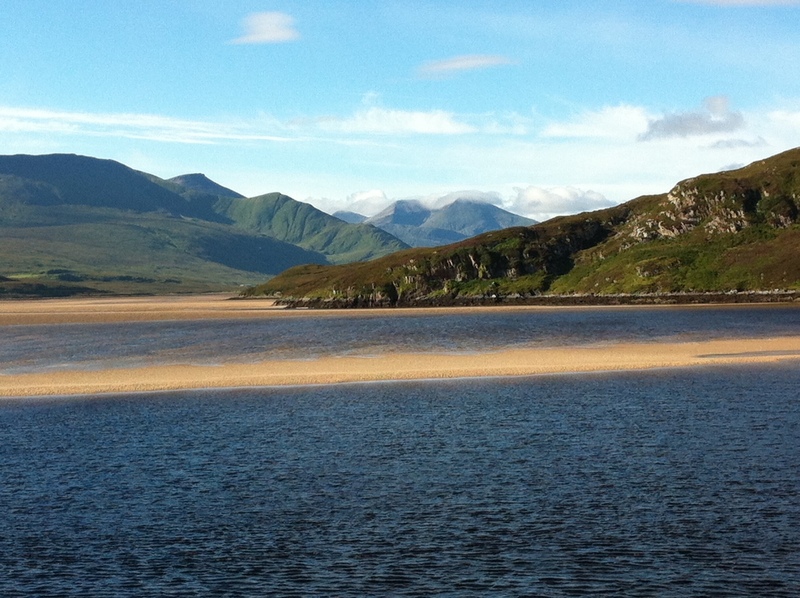 We had woken to glorious conditions in Durness. Breakfast at the Lazy Crofter Bunkhouse was a bit of a make-do. Fortunately however the local Spar opened early enough to get bread and butter (and in my case the biggest sausage roll I have ever had). The ferry from Durness to The Parph is actually a small boat which carries around a dozen passengers. At the other side we were met by Alan and his minibus. He runs to and from Cape Wrath, more or less on demand, around five times a day. He was very entertaining. On the way to the Cape we passed two groups of cyclists. 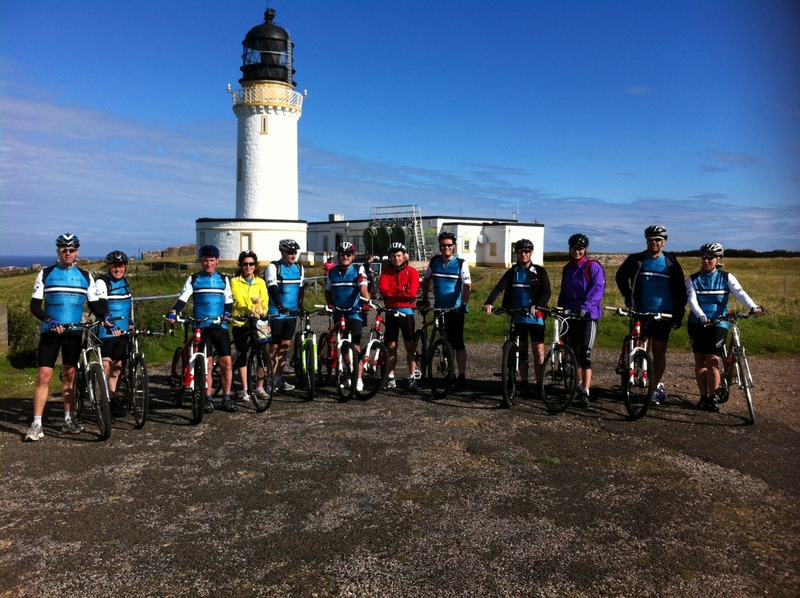 It turns out that one was a family of four who were just completing the ride from Dover to Cape Wrath on tandems (and told us they had enjoyed tail winds for the most part!). The ‘road’ is actually a badly broken up and pretty rough track. 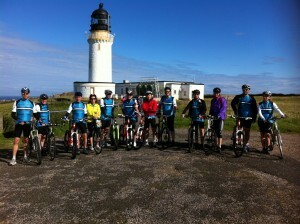 Simon and Ian had rented mountain bikes locally for the journey back to the ferry. Since Steve had lost his special cream, he was allocated one with extra suspension and bounced around like a school boy on a BMX track. Amazingly, given the amount of debris and scree, there were no punctures. The Cape is a real wilderness, an area of outstanding natural beauty and it was a privilege to be there. But it was really just an aperitif for what was to come. The road from Durness to Inchnadamph must be the most scenic in the UK. It is, by a long way the most spectacular landscape I have ever cycled through. The vistas are breathtaking and show Scotland’s rich geological heritage at its very best. And it did not stop when we stopped, the Inchnadamph Hotel sits in the shadow of Ben More, a truly stunning setting. No tea shops today, but some of us had a good lunch at The Anchorage in Scourie. Chris, Andy, Gavin and Neville preferred chilled sandwiches from the local Spar. 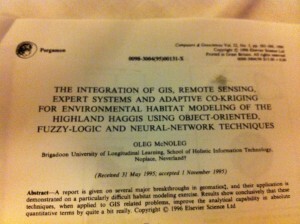 In the evening it was the first opportunity for some to sample haggis and very good it was too. 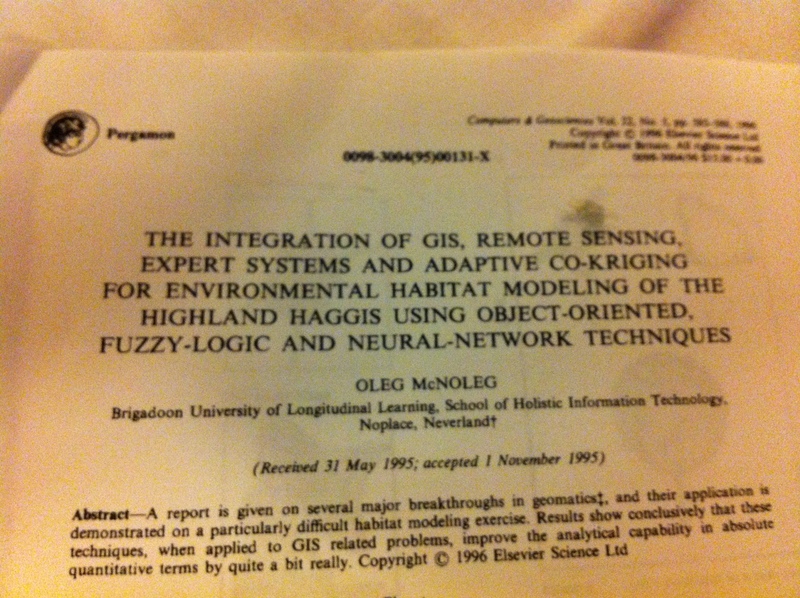 Kate asked the waiter where haggis came from and he provided us with a fascinating scientific paper. Being cutting edge science, it has a very long title, so I have posted a picture rather than writing it down. It is worth reading. We have managed to get to the end of the first day without a single puncture. Chris J did require a tyre change, probably due to damage on Cape Wrath. That’s close enough to give him the honour of being the first to sport the pink bell. No mechanical failures either. Karen has developed a squeak, the source of which she cannot track down, so we all took shifts riding with her so she could tell us about it. There is not a single set of traffic lights from Cape Wrath to Inchnadamph, so Neville is still on the right side of the law. The Support Team are again doing an outstanding job. They are so well organised this year they have brought their own kerbs so they can play kerby wherever they are, whether there are kerbs or not (and in principle that includes their hotel bedroom). Any gaps in the kerbs on University Park should not be ascribed to poor maintenance, they will be returned in a couple of weeks. At 58 miles, this was a short day, but we had planned that, given the late ferry start and getting to and from Cape Wrath. That said, it was a pretty demanding 58 miles with a total climb of almost 3,000 feet. Tomorrow is a similar distance, driven by the logistics of finding places in these remote parts which will accommodate all of us. I doubt it will equal today’s leg in terms of landscapes, but we will see. Kate – you are a star. Keep going. This comes from N W China where the mountains of Mongolia provide the final anchorage for the northernmost psrt of the Great Wall of China and a setting for 11thC Imperial tombs and Genghis Khan – a real bringer of Wrath. Wish you well. Keep going. Sounds wonderful, I’m quite jealous. Good luck for the rest of the trip. By the way, ‘Parph’ is also a version (Gaelicised in this case) of Old Norse Hvarf and the modern form Wrath. An ever-changing name!